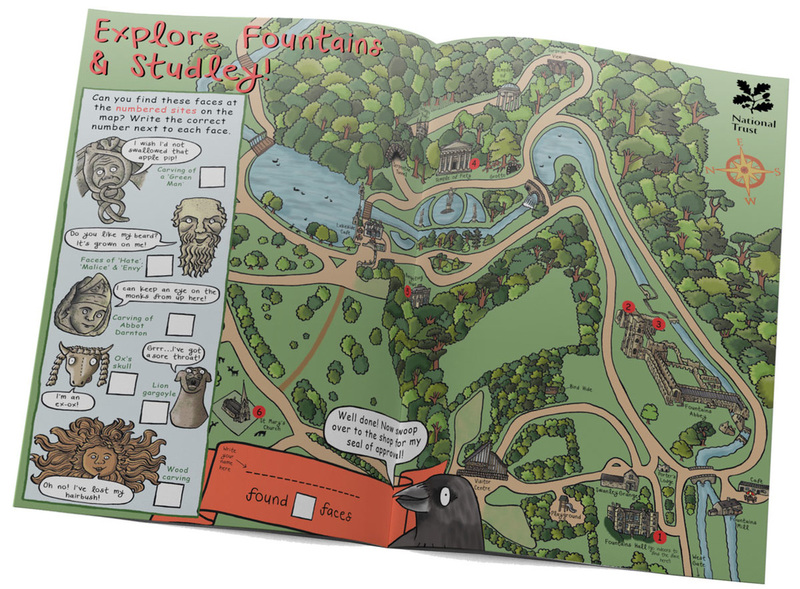 Children's illustrator and trail designer Emma Metcalfe was commissioned to devise and illustrate a bespoke children's trail for Fountains Abbey and Studley Royal, one of the National Trust's key sites and a World Heritage Site. It's no surprise that the beautiful Cistercian abbey ruins are the main draw for visitors to Fountains Abbey & Studley Royal, yet there is much more to see throughout the beautifully landscaped grounds. The Education Officer was keen to come up with a trail which would encourage visitors to explore the site further, and would provide an additional family activity for returning visitors. ﻿One of the key considerations for the design of the illustrated trail was that it did not confine families to a set route, as the site is very large and would be hard work for families with young children to explore all in one go. ​An illustrated map trail proved to be the best approach, with families encouraged to visit numbered sites in an order of their choice and with no need to visit all of the sites in one visit. It is an 'I spy' style trail with a different face to spot at each numbered site. 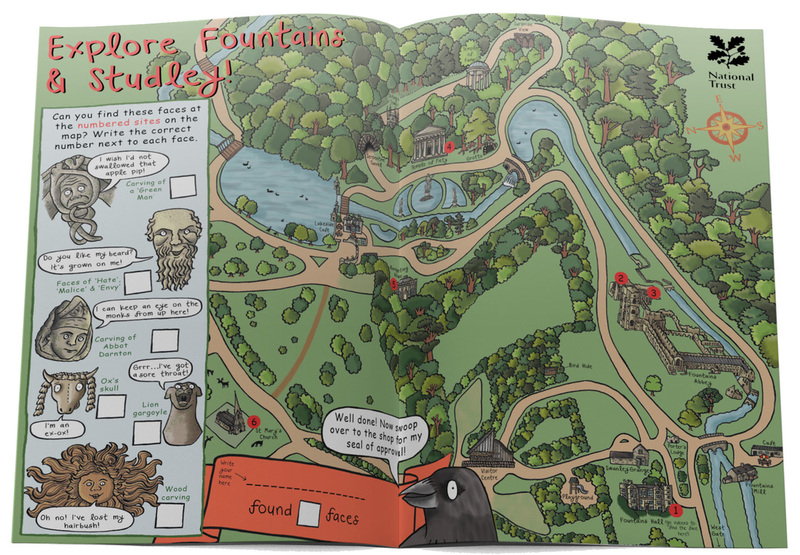 ​To make the most of the available space, the front cover design features the many animals and birds which can be seen at Fountains Abbey: see how many you can spot in the picture and during your day out! The front cover also features the iconic abbey ruins. During a site visit, the Education Officer commented that visitors can struggle with getting their heads around the 2000 year history of the abbey site. 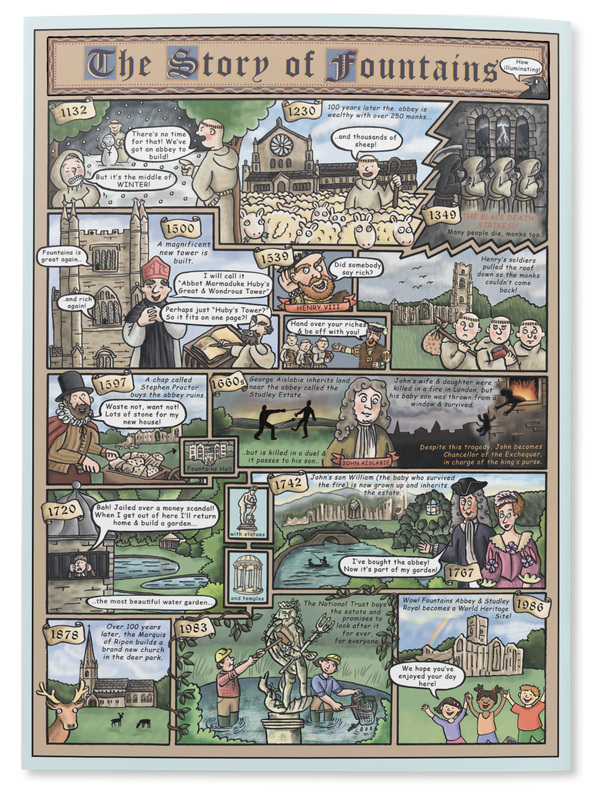 As a result Emma devised and illustrated a one page comic strip giving a light-hearted overview of the key people and events in Fountains' history. It is popular with both children and adults! ​Emma also designed a children's character, Jack the Jackdaw to feature on children's activities on site. ​The finished family trail is a single sheet of A3 paper, folded once to A4. 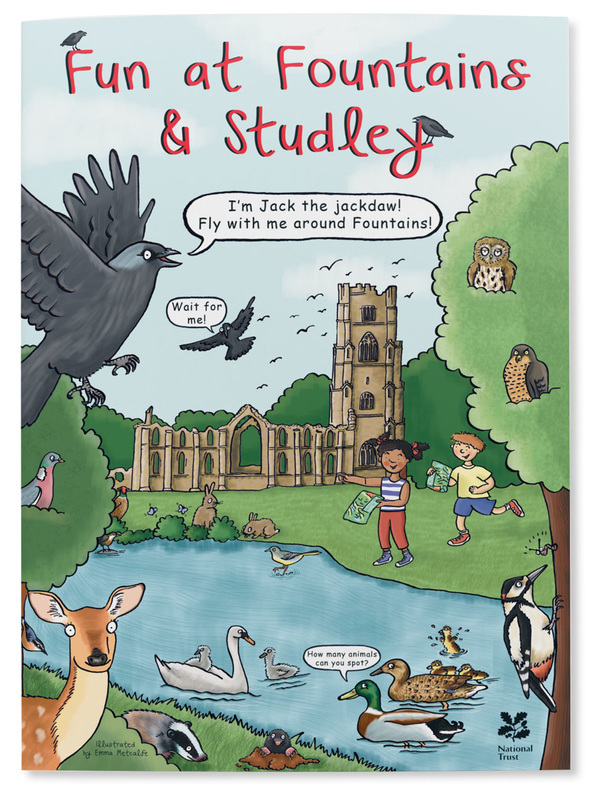 Fun at Fountains and Studley is available from the front desk for visitors to Fountains Abbey.